BRUSSELS, Belgium -- Russia is violating an internationally-agreed ceasefire in Ukraine "again and again", NATO's chief said on Wednesday, accusing Moscow of continuing to arm separatists in the conflict at the center of East-West tensions. NATO Secretary-General Jens Stoltenberg briefs the media during a NATO defence ministers meeting at the Alliance headquarters in Brussels, Belgium, June 14, 2016. Some European governments are eager to lift the economic sanctions that the West has levied on Russia over its role in the Ukraine crisis. But the assertions by NATO Secretary-General Jens Stoltenberg of continued fighting and Russian support would make it difficult to ease any penalties under the terms of the Minsk peace deal. 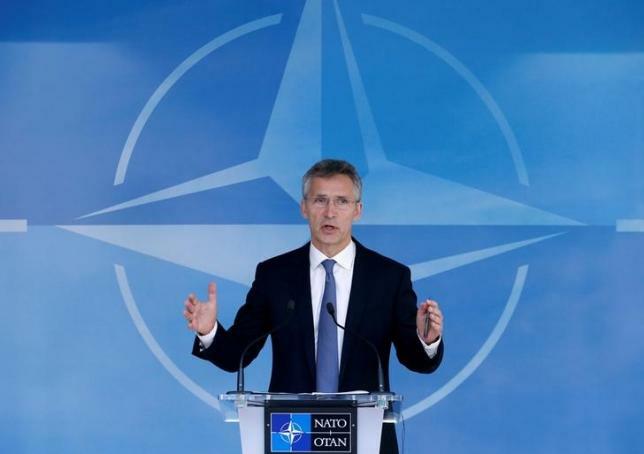 "The ceasefire is violated again and again, and this is of great concern," Stoltenberg told a news conference following a meeting about Ukraine with NATO defense ministers. "Russia supports the separatists ... with equipment, with weapons. They also mass troops along the Ukrainian border," he said. There was no immediate reaction from the Kremlin, which has denied any direct support for the rebels. Moscow returned to Kiev jailed Ukrainian military pilot Nadezhda Savchenko last month, in a prisoner exchange welcomed by Western politicians. Europe and the United States have linked any softening of the economic sanctions on implementation of the peace deal signed in Minsk in February 2015, which calls for a full ceasefire in the rebel-held areas of Donetsk and Luhansk. EU leaders must decide at a June 28-29 summit whether to extend sanctions on Russia's financial, defense and energy sectors over what the West says is Moscow's support for separatists in the conflict that has killed more than 9,400 people since April 2014. OSCE international observers recorded more than 200 explosions on Sunday and Monday in eastern Ukraine, as well as shelling, heavy-machine-gun fire and grenade attacks that destroyed buildings and left craters in the ground. Asked about the report, Stoltenberg said: "We see many ceasefire violations over a long period of time. There are also many casualties. Ukrainian soldiers have lost their lives." Ukraine's defense minister, who joined NATO defense ministers for their meeting in Brussels, said civilians were being shelled in the city of Donetsk and that Russian-backed rebels were increasingly using heavy weapons. "We have evidence that separatists are firing at Donetsk," Stepan Poltorak told a separate news conference. "How can we talk about a ceasefire when it is violated 50 or 60 times a day, when we have soldiers wounded every day? Violations are made by heavy artillery, which is banned by Minsk," he said. Your title to this piece (NATO "scolding" Russia) explains better than anything found in its body as to why the Minsk Agreement continues to be violated. There is an old lady in my neighborhood who goes around to all the neighbors reprimanding, chiding, and finding fault with one or another. She is referred to - with a touch of humor and much indulgence for her senility - as "the scold". Obviously, no one takes her seriously. Perhaps, after so many months of "scolding", NATO should start - without fanfare and without the blowing of trumpets - serious training and arming of Ukrainians with the advanced weapons they need to defend themselves and cause Russia some serious losses in Ukraine. offering medical treatment to Ukraine's wounded troops) while leaving the front door open for more Ukrainian casualties is not the solution. It is merely "a scold"
I fully support your statement. Bnewsbd.com- Letest and Largest bangla online newspaper in Bangladesh.